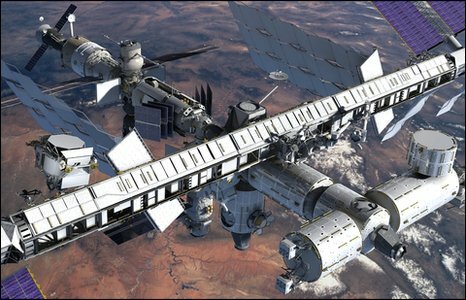 An anti-matter detector to be installed on the space station is to have a key component changed in order to help it spend longer in space. Scientists plan to replace the liquid helium-cooled heart of the detector with a long-life magnet that already has spent time in orbit. Modifying the device should increase the time it can operate in space from three years to as long as 18 years. The Alpha Magnetic Spectrometer will be brought up on the space shuttle. AMS is designed to look for anti-matter particles and markers of dark matter, among other experiments. With more than 300,000 data channels, the detector generates too much information to radio it all to Earth, so it includes a supercomputer to crunch the data in orbit. The computer pushes AMS power requirements to 2.5 kilowatts, far beyond what a typical satellite's solar panels can produce, but well within the station's 100-kilowatt power supply. Nobel laureate Samuel Ting, the Massachusetts Institute of Technology (MIT) physicist, is overseeing a 500-member, multinational team of scientists involved in the $1.5bn project. "We began thinking about this at the end of last year and the beginning of January when people were talking about the space station going to 2020 and beyond," Professor Ting told BBC News. "I began to realize that we'd have a museum piece." US President Barack Obama has proposed to extend the life of the space station for at least five years beyond 2015, with a budget of about $3bn a year. Unlike ground-based particle accelerators, AMS samples high-energy particles directly from deep space. It can detect particles with vastly higher energies than what can be produced in particle accelerators. The Large Hadron Collider (LHC) at Cern, for example, can smash particles with a combined energy of about 7 tera-electronvolts, or TeV. A cosmic ray, by comparison, can have energies greater than 100 million TeV. "The sensitivity of AMS is a factor of 100 to 1,000 times more than previous instruments and the fact that you can stay in space for 10 to 18 years makes it even more sensitive," Ting said. "This really is the very first very, very precise particle physics detector," he said. "You enter into a totally new domain. It's very hard to predict what you'll find." Dumping AMS' cryogenic superconducting magnet cuts the power of its magnetic field to bend the path of charged cosmic particles as they pass through five different types of detectors. But Ting says the addition of spare detectors and the extra years in orbit more than compensate for the diminished field strength. The replacement magnet was part of a prototype AMS that flew on a 1998 space shuttle mission. It was recently taken out of clean room storage in Germany and tested. 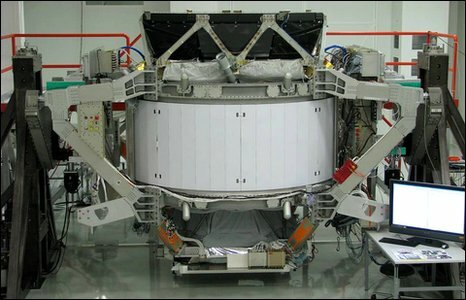 It is due to arrive at Cern, where AMS is being assembled, this week. Modifying AMS would delay the space shuttles' planned 30 September retirement to later in the year. It had been slated to launch in July on Nasa's next-to-last space shuttle mission.